Gold medalist Katie Ledecky (left) of the United States poses with silver medallist Federica Pellegrini of Italy during a medal ceremony at the FINA World Championships in Kazan, Russia. Americans love competitors — in business, in politics, and in sports. And for some of us from the bad old days when only the guys got to play team sports, it's a very special thing to see women blowing through doors that not so long ago were closed to them. 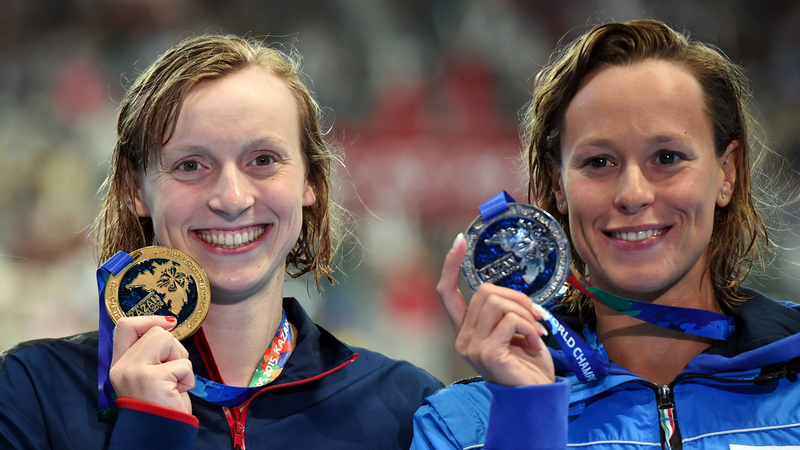 Consider Katie Ledecky. The American swimmer has been the gracious, warm-hearted, smiley, cutthroat competitor in the World Swimming Championships in Russia, mopping up the pool (if such a thing could be done) with everyone else, winning gold medals in long races — her specialty — and then winning another in a short distance where she rarely competes, and all of it in a compressed period of just a few days. Professional football has just hired a woman coach. Jennifer Welter will coach inside linebackers for the Arizona Cardinals at their training camp. Her assignment includes, of course, some rough and tough veterans who, by all accounts, are OK with their new coach, even admiring of the way she loves hitting. Basketball is racking up a few firsts as well. The Sacramento Kings have just hired Nancy Lieberman, a pioneer in the sport. She played for the U.S.A. in the first Olympics to include women's basketball. And Becky Hammon, a former WNBA star, is coaching for the San Antonio Spurs. Both the women and their teams acknowledge the possibility that one day a woman will be the coach of an NBA team. Maybe so. But it's not over yet. Just of few days ago a Charlottesville, Va., traveling basketball team was disqualified from a national tournament in the middle of a five-game winning streak because there was a girl playing on a boys' team. Well, she'd been there all along. At two national championships. Not in disguise. A point guard in a pink headband. Kymora Johnson begged officials to disqualify her alone and let her team play, but they said no. The Washington Post says Kymora Johnson wants to "fight for the right" to play next year. Those "officials" had better look out — because next year, Kymora will be 11 years old.